This is a good diea. 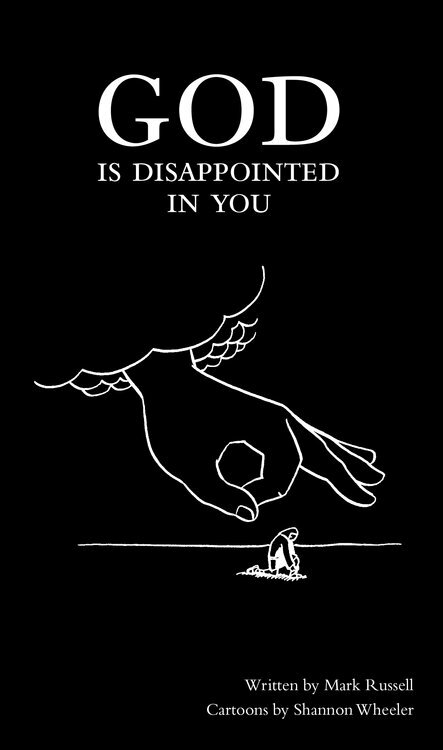 A good film too. Can’t Stop The Serenity is, well, I’ll let them describe it. Can’t Stop the Serenity (CSTS) is a unique opportunity to indulge your geeky side while doing some good! Since 2006, fans have organized screenings of Joss Whedon’s Serenityto raise funds and awareness to support Equality Now in their work for the protection and promotion of the human rights of women around the world. Join us as we aim to misbehave for a good cause! Serenity, is of course the film adaptation of Firefly, the unfortunately short-lived TV series from Joss Whedon , creator of Buffy, and writer/director of Marvel’s blockbuster film, The Avengers. Here’s the trailer to jog your memory, and here is where you can buy tickets for the Perth, Western Australia event. Now that San Diego Comic-Con is only hours away, expect more announcements like this. Well, this DC Comics documentary focusing on its supervillains was announced a while ago, but here is the first trailer, and it’s looking good, er…evil. BOOM! Studios surprised the industry two weeks ago by announcing they had purchased independent, and critically acclaimed publisher Archaia, which you can read more about here. Now they’ve unveiled their shiny new website. Official lowdown about that below. Oh, and they’ve also just announced that they’ve signed legendary artist George Perez to an exclusive deal. Wow. BOOM! 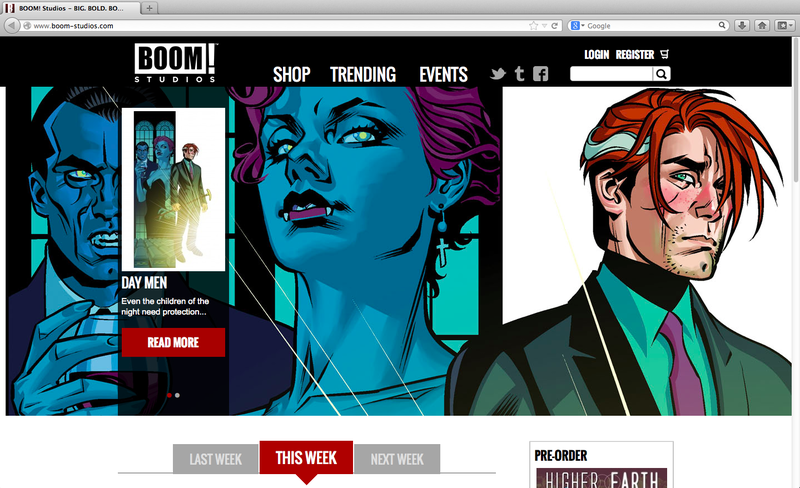 Studios is pleased to unveil their newly redesigned website (boom-studios.com) today. Beginning today, fans will find a fresh, modern look with an easier-to-navigate interface along with more social media integration. The new boom-studios.com was designed by At Play Creative, the same design agency responsible for the redesigned BOOM! Studios logo that debuted earlier this year. The design team, led by Founder and CCO Gary M. Smith, worked closely and collaboratively with BOOM! to deliver a design that showcased the comic art first and foremost. At Play clients include ABC, Disney, and Hasbro among others. In addition to a comprehensive online store, the relaunched website incorporates live feeds from BOOM!’s Twitter, Facebook, and BOOM!Pen Tumblr on a new Trending page with spotlighted Featured posts. The site includes information for Press and Retailers, with more to be added in the future. An Events page adds an easy reference point for all BOOM! convention appearances, signings, and launch parties. Kaiju is a Japanese word that means, “strange beast,’ so Wikipedia tells me. It’s also a buzzword at the moment, thanks to this week’s release of Guillermo del Toro’s Pacific Rim. As a refresher to what Pacific Rim is, check out the latest trailer and featurette, and get excited! If you like what you see on the big screen and want to see more of giant monsters fighting other giant monsters (and robots), then you might want to see the sale that Madman has on now, featuring some great films such as Big Man Japan, Troll Hunter, Monsters, and Godzilla classics, and anime like Neon Genesis Evangelion, and Gigantor. 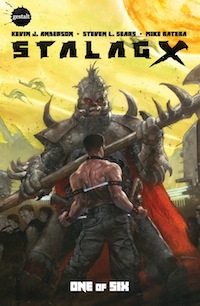 My review of the debut issue of Stalag-X, written by acclaimed novelist Kevin J. Anderson is here at Broken Frontier.